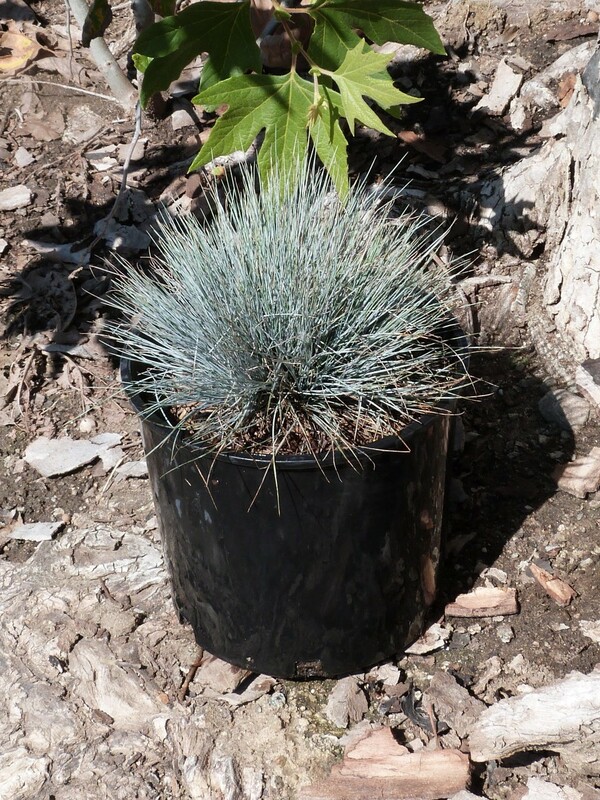 ‘Elijah Blue’ blue fescue is a unique plant for smaller space low-maintenance landscapes. It is a good addition to small spaces or urban lots due to its compact size; plants grow only to 8”-12” tall and 6”-8” wide. Its blue-green foliage makes it a standout in any plant arrangement. The fine texture of the foliage also provides contrast against leafier companions. ‘Elijah Blue’ makes for a lovely border and looks wonderful planted en masse in rock, cottage, and xeriscape gardens. Green purple-tinged flowers appear in the spring and fade to a golden tan color in the fall. Some gardeners sheer flowers off to help the plants conserve energy during the summer months. ‘Elijah Blue’ is also a perfect addition to patio or entryway containers filled with other low-maintenance plants. Blue fescue thrives in full sun, drought and has low water requirements once established. Though this plant is very resilient, it can suffer during humid summers and can die off from rot if overwatered. Be sure to plant with other low-water needs plants so as to avoid overwatering. It is also recommended to divide blue fescue grass every few years to keep plants looking their best.